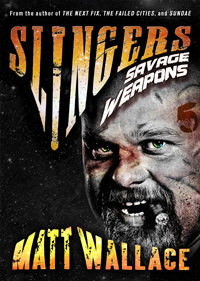 SLINGERS: SAVAGE WEAPONS is the final ebook in the five-part Slingers Saga, an epic fiction serial by Matt Wallace, the award-winning author of THE FAILED CITIES. You will receive this 20k-word ebook in MOBI, EPUB, or PDF format compatible with most ereaders on the market, including Kindle devices. And they'll need help to overcome the most powerful enemies imaginable. They'll need the army of forgotten souls whose plight drew them down from their ivory tower and into a world of harsh realities and deadly conspiracies. They'll also need the man who has become the most unlikely savior of the lost, the diminutive deposed crime lord known as Cuatro.